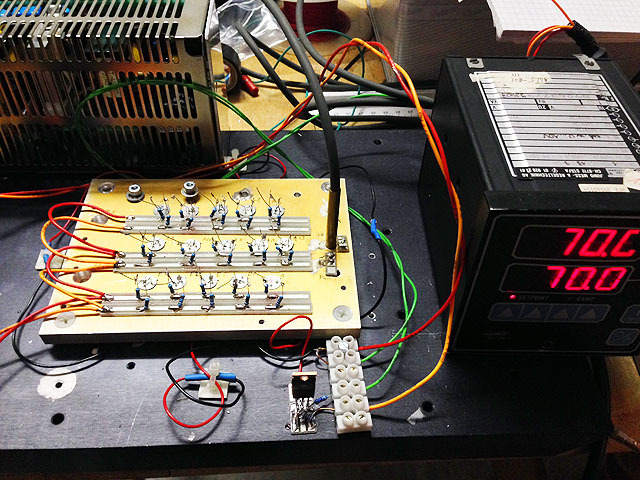 This is a slowly ongoing project that ties together various kind of interesting electronics. 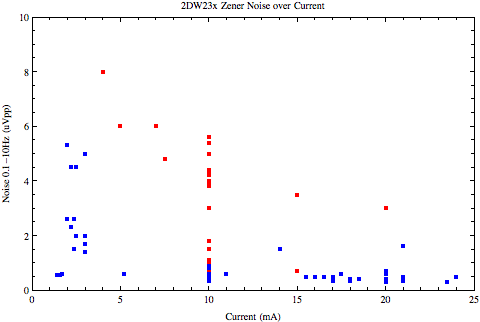 The issue is to create a voltage/current reference with lowest practically possible noise. This is motivated in part by a long term project to develep a cheap, stable and low noise current driver for laser diodes (to complement my Arduino based TEC controller). 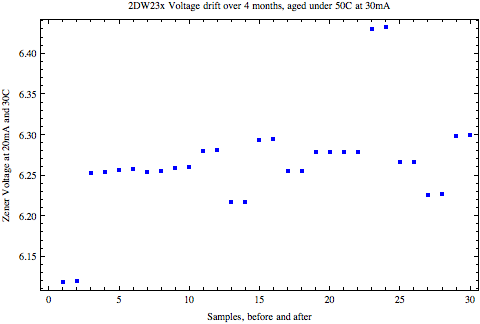 It was mainly motivated by the discussions at eevblog on the Chinese super-low noise Zener diodes 2DW23x. This is kind of a sweet electronics challenge and so I had to get a few of those to play around with. I won't add a lot on top of what has been discussed there by very competent people, except I may incrementally add a few observations and findings of from time to time. 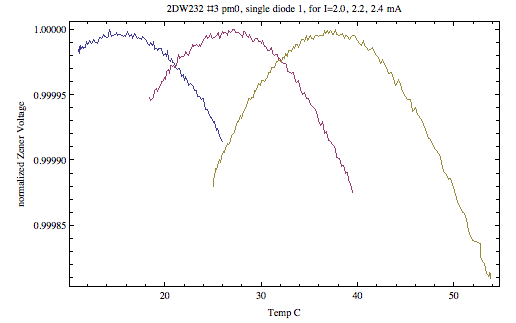 There are three important properties of a Zener diode with regard to application as a reference: temperature coefficient (TC), noise, and long term stability. I was and am spending quite some time in measuring these for a selection of like 40 diodes. Below the upshot. More data will be added incrementally over time. 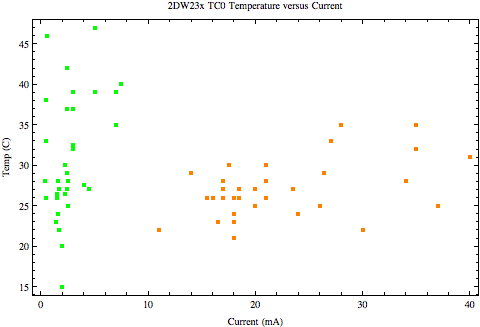 There is a current range for which the temperature coffecient is low and actually turns through zero at a relatively narrowly defined current. 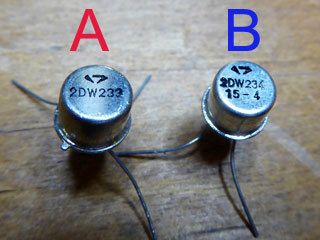 The 2DW23x Zeners have two diodes back-to-back, which gives alltogether 4 possibilites: 2 from using the single Zeners ("single diode config"). and 2 from using one Zener forward and one backwards ("series diode config"). For single config the Zener voltage is around 5.4V and the series config about 6.2V. The series config has the advantage that the range for small TC is broader and occurs at a higher current (where the noise is lower). It turns out, not suprisingly, that for any given sample, there is no significant difference in the data between the two single and the two series configurations, respectively. Orange dots: series diode configuration, green dots: single diodes. The most interesting feature of these diodes, namely that they can have almost incredibly low noise, was pointed out at eevblog here and here. It can come down to much less than 1uVpp for 0.1-10Hz bandwidth, which beats even the best reference diodes on the market, such as the LTZ1000 . This is in principle interesting for me with my quest to build an ultra-low noise laser diode driver. 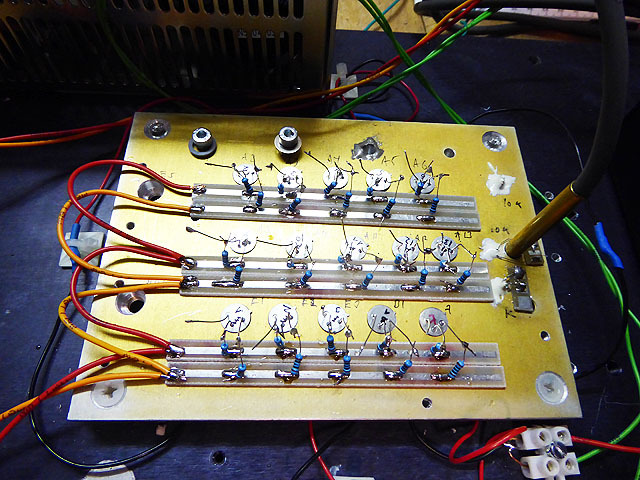 So I had first to build suitable low noise preamplifiers to test various samples; these are described here. 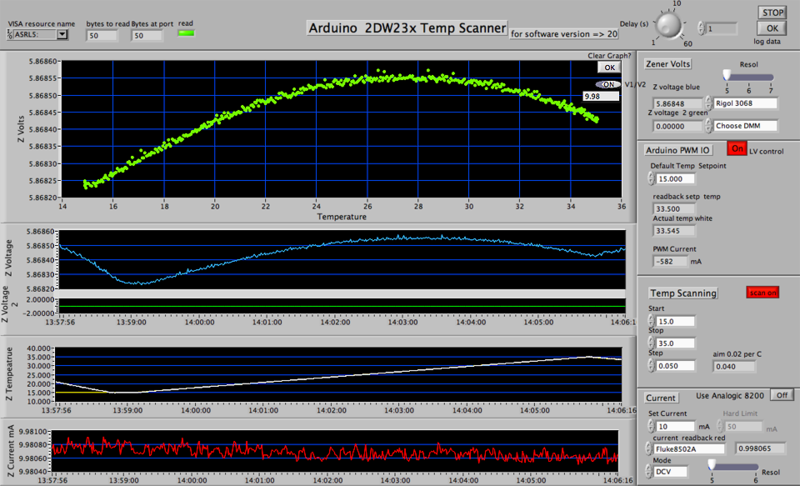 Red dots: batch A, blue dots: batch B (currents at 10mA and above refer to series diode config). Clearly batch B has in average substantially lower noise than A. 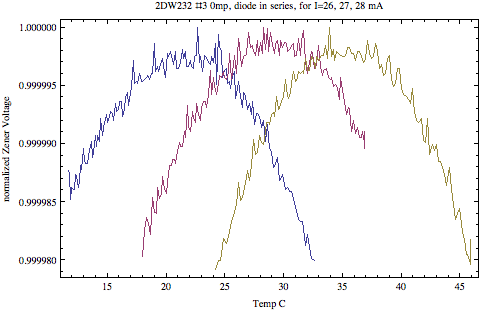 Actually I have dropped from the plot a few outlier cases at 15, even 20uV, from batch A. So, at any rate we see that individual testing is necessary, if noise is an issue at all. 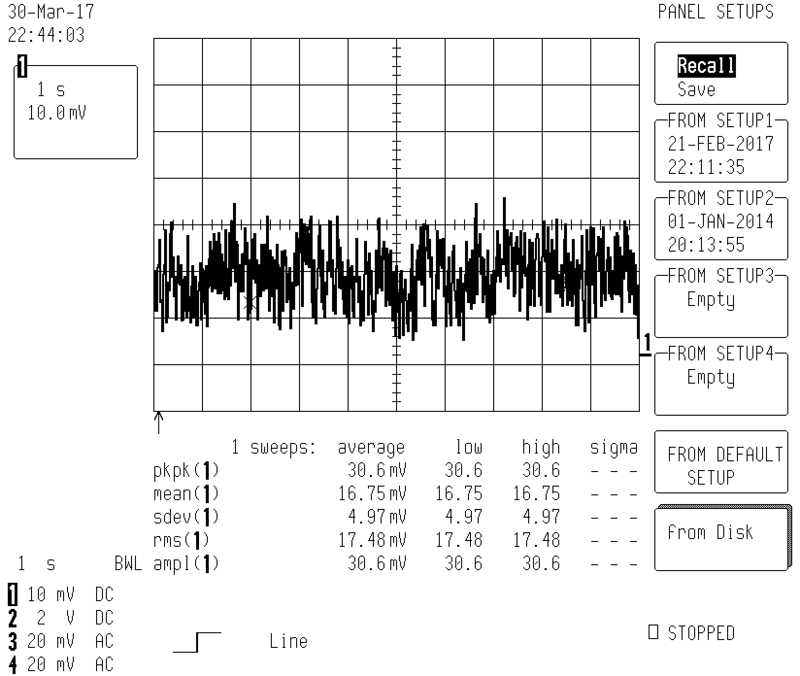 Note that my amplifier itself has noise of about 200-250nVpp, so the diode noise has definitely lower than 300nVpp. 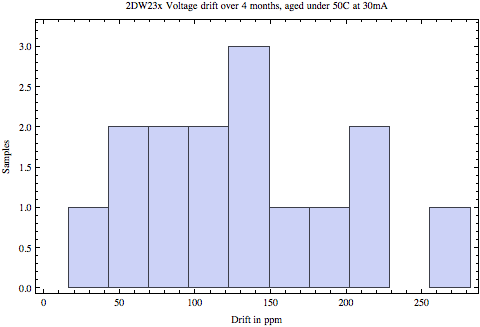 Important is of course also the long-term drift of Zener voltage. 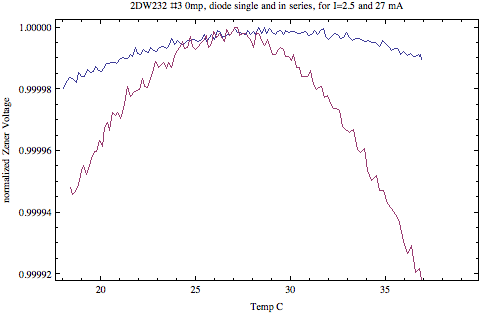 Since there is no reason why it should be low for such cheap diodes, there could be bad surprises. Unfortunately this is a very lengthy process that takes thousands of hours burn-in time. I intend to add here results here and then when they arrive.